Black, Bronze, Narragansett, White Holland, Slate, Bourbon Red, Beltsville Small White, and Royal Palm are beginning to replace the name “Butterball”* when we refer to our turkeys at Thanksgiving. These are names of the eight varieties of turkeys set by The American Poultry Association (APA) that fall under the definition of heritage turkeys. Eating turkey on Thanksgiving is tradition, but the Butterballs and some others available in the grocery stores barely resemble those enjoyed by early settlers or even those eaten 100 years ago. About 70 years ago turkey breeders changed the way they raised birds. The trend began with breeding turkeys to have large breasts and small legs. These birds could grow to full size on less feed and in half the time as the old-breed turkeys – this lead to cheaper and faster and the flavor went out with breeding. If we allow the natural flow of life, turkeys hatch in the Spring, and reach a perfect weight for harvesting, right around November (just like pigs!) With artificial insemination and large indoors facilities, turkeys became available year round. The old heritage breeds were almost lost to extinction. The Heritage Turkey has a genetic ability to withstand the environmental rigors of outdoor production systems. Back-yard farmers and a few major turkey growers have had a renaissance this past decade committing the extra time, expense, and effort in raising these birds that fly, roam freely, and breed naturally. 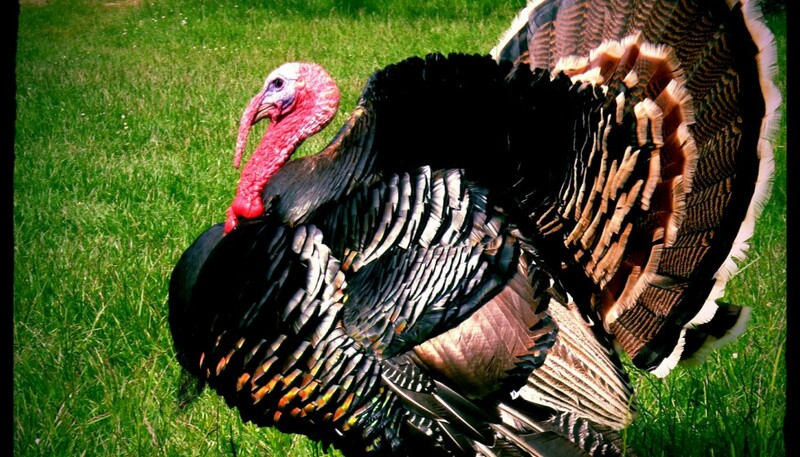 The Heritage Turkey must have a slow growth rate, reaching a marketable weight in about 28 weeks which allows time to develop a strong skeletal structure, healthy organs, fat (YES!) and muscle mass. Older birds also have much thicker skin, which helps keep the meat moist in roasting. Jan has talked to farmers across the Martha’s Vineyard to Joel Salatin, and to Mary’s Turkeys To find out about how they raise birds and what they feed them. All the turkeys that she knows of are pastured on Martha’s Vineyard, meaning they are free to range outdoors and forage to supplement their feed. Most are surrounded by a light electric fence and they get rotated around. We have friends who allows their turkeys complete free range without a fence. However, even the best of heritage breeds turkeys often are raised on GMO corn. Consider your choices carefully. Organic means GMO-free. These heritage turkeys look a bit different on the platter than your average butterball, with long legs and wings, a pointy breast and a darker color skin and overall darker meat (a sign of well-exercised birds.) There is also a layer of fat under the skin that is not so common with the commercial varieties. Taste is more rich and flavorful. There’s no denying that price is a big factor when considering heritage turkeys. Supermarket turkeys averaged $2.50 per pound. Heritage turkeys can cost upwards of $10 per pound; plus, required overnight or two-day shipping can nearly double the price. Some farms charge a flat price for a range of weights, such as 10- 12 pounds $100. Also a small turkey for some farmers may be 16 pounds. The farmers interviewed are not getting rich on turkeys. It is a labor of love or a service to provide to their loyal customers. These rare, slow-growing, odd-size birds are far more expensive to raise and process. When a heritage bird is the center of the table on Thanksgiving, it is an investment. Like other prime cuts, like grass fed prime rib or pastured berkshire pork tenderloin, we really can only afford to eat these at special gatherings. Where can you find these birds? Ask around and contact a local grower, ask your butcher or talk to a farmer who might just grow one for you or who happens to know someone who is raising heritage for the holiday. You are not only save them from extinction, but bringing back real taste, contributing to our cultural farming community and contributing to your health by eating a bird that is eating good food and living a good life! Rinse your turkey very well and pat dry. Add 1 medium cubed yellow onion, a chopped orange (skin and all), 4 tablespoons chopped sage, thyme and rosemary may be added to cavity at this time if desired. I love to put sage and the under the skin between the skin and meat around the bird. I melt one stick of butter and pour over the entire bird, then sprinkle bird on the outside with 1 tsp salt and ½ tsp pepper. Place turkey on a rack in a large roasting pan place 1 ½ cups apple cider and place in oven preheated to 400 degrees for 30 minutes. After 30 mins., remove from oven and baste exterior with juices cover tightly with foil (careful to not allow the foil to touch the bird) return to oven and reduced the temperature to 275 degrees. Plan to bake bird for 30- 35 min per pound and bake according to time/weight ratio. Heritage birds should cook longer and slower than your Butterball. Check for doneness when the drumstick feels tender and moves freely and juices from bird run clear. Internal meat thermometer should reach 170 degrees. 30 minutes before bird is to complete baking time, remove cover baste bird with ½ natural juices and butter return to oven in open roasting pan to brown lightly.